Now in its fourth year, the U.S. Multi-Sport Directory has evolved into a 260-page guide to all-things-endurance, including triathlon, duathlon, marathon, utra-marathon, adventure racing, and cycling events. For 2007, publishers added coaches, camps, clinics, clubs, and product review sections, as well as editorial reports on events they visited across the country last year. The international event section doubled, too. "The whole concept of the U.S. Multi-Sport Directory is to provide complete, accurate information on all of the venues in one comprehensive resource for easy reference and planning for the year," says Warren Knoll, director of sales and marketing, U.S. Multi-Sport Publications LLC. "There are a myriad of fantastic events across the country and people want to find what they're looking for quickly and have plenty of options to choose from." The directory's 2,300 listings are cross-referenced by category and state. "We've been involved in multi-sport for most of our lives and craved to give something of value back to the community, so we created the Directory," publisher Hubie Krawczyk says. "Our mission is promoting fitness lifestyle through multi-sport and endurance activities across the country, and making it fun and accessible to people at all levels of fitness and performance." Knoll and Krawczyk traveled extensively in 2006, "living the lifestyle" researching and reporting on various events. "If we can lead you to interesting, new or unique destinations, help add a race or camp to your visit to the mother-in-law or business trip, or connect with a coach who understands your wants and needs, then 'mission accomplished,'" adds Knoll. Established in 2004, inaugural U.S. Multi-Sport Directory started with 350 events. The 2005 edition grew to 1,500 events, and it grew by 25% more for 2006. The 2007 directory includes more than 2300 listings. 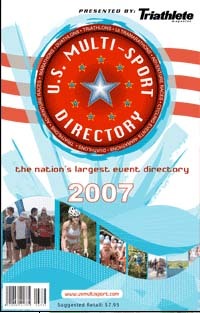 The 2007 U.S. Multi-Sport Directory is available for $7.95 plus shipping and handling, by visiting www.usmultisport.com, emailing info@usmultisport.com or calling 414.483.5412. To be included in the 2008 directory and for a rate card, write to info@usmultisport.com, or call Hubie Krawczyk at 414.483.5412 or 414.550.4769, or Warren Knoll at 414.483.5412 or 414.403.7982.